Fluid loss from oilfield muds and cement slurries to a permeable formation can significantly impact their performance or damage the formation. If a cement slurry loses too much fluid, its strength will be compromised and costly remedial well treatments may be needed. 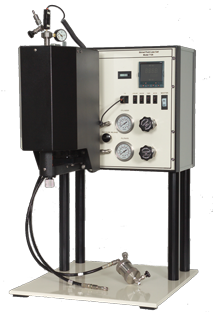 The Model 7120 Stirred Fluid Loss Cell measures the fluid loss properties of muds and slurries in accordance with API procedures. Chandler Engineering developed the Model 7120 Stirred Fluid Loss Cell to eliminate safety issues with the traditional instrument designs. The Model 7120 is designed to be as easy to use as possible, with clear and intuitive controls. Once the cement slurry or mud is placed into the test cell, a programmable temperature controller increases the temperature at the desired rate. The slurry is conditioned by stirring at 150 rpm similar to a consistometer. The cell is then inverted to begin the fluid loss test. A graduated cylinder or the back pressure receiver is used to collect the filtrate for measurement of the fluid loss characteristics of the slurry.